It’s now a long time since downforce aids were invented for racing cars. The use of inverted wings – and later, ground-effects tunnels – revolutionised the ability of racing cars to stick to the road around corners... especially high-speed corners. But developing downforce inevitably results in increased aerodynamic drag – the reason that the drag coefficient (Cd) figures of racing cars are nearly always so bad. And, in turn, that makes nearly all racing cars poor examples to use when trying to reduce drag on road cars – or even to picture how drag can be reduced. The exceptions – racing cars with very low drag figures – are solar racers, and some vehicles in very limited categories with tiny engines. However, for other reasons, these cars also don’t make great role models for normal road cars. In fact, to return to racing cars with low drag figures means taking a look back at the Fifties (and, to a lesser degree, the Sixties). And that’s what we’re going to look at here – not examining all the possible cars, but looking at just a handful of cars for which I have found aero data. One fascinating family of race cars for which data is available are the Jaguar racing cars of 1950 – 1955. 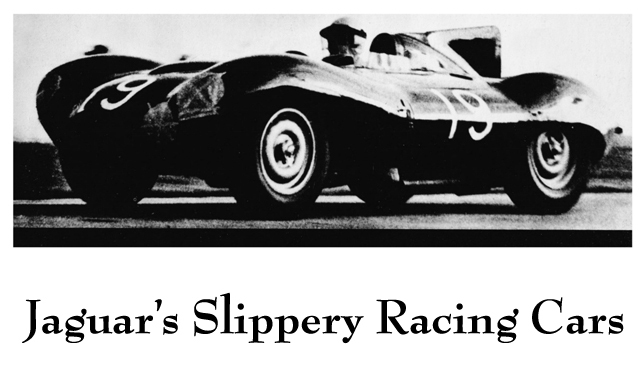 In 1950 Jaguar raced the XK120, a car with 161hp and a frontal area of 13.86 square feet. At 100 mph, this car used 68hp just to overcome drag! Furthermore, while at rest the weight distribution was 48.5 per cent front and 51.5 per cent rear, at “speed” (this number is not defined but you can assume - say – 100+ mph) this weight distribution changed to 46:54. With the drag power (68hp), the frontal area (13.86 square feet), and the speed (100mph), you can calculate the drag co-efficient (Cd) of the racing XK120. See Power to move if you want more on how to do this. By 1951, Jaguar engineers, working very hard on reducing drag, had made some major improvements. The car was the C-type and frontal area dropped only fractionally to 13.8 square feet. But drag power dropped by a massive 24 per cent to 53hp! But there was a problem looming: static weight distribution was 51.5: 48.5 but when travelling at speed, this altered rather dramatically to 58:42! A light tail, anyone? By 1952 we had the Series II C-type. This kept the same frontal area (13.8 square feet) but the extended tail (that would have kept airflow attached longer, thus reducing the size of the wake) reduced drag power by another 21 per cent to 42hp. So from 1950 to 1952, drag power had been reduced by a massive 38 per cent! But the trade-off was equally massive: static weight distribution was 51.5:48.5 but at speed this altered alarmingly to 65.5:34.5! That rear kept the flow attached but boy, did it create lift! It was time for a rethink, which came with the 1953 prototype D-type. Frontal area was up a tad at 13.9 square feet and drag power was down only a little to 40hp. But what about the high speed weight distribution? Static weight distribution was 54:46 but the fast-moving weight distribution was much improved at 50.5:49.5. The Jaguar aero engineers must have been wondering where they could go from here, but with the 1954 D-type they managed to drop frontal area by 10 per cent to 12.5 square feet, neatly explaining the decrease in drag power by the same percentage to 38hp. Weight distribution – both static and aero-active - also changed only a little, to 53.5:46.5 at rest and 51:49 at speed. The 1966 Porsche Carrera Long tail had only 220hp available and yet could reach a top speed of 171 mph (265 km/h); its quoted Cd was 0.33. The almost unknown CD Peugeot 66, also of 1966, could reach 152 mph (245 km/h) on just 105hp! The Jaguar photos (but not the diagrams) have been drawn from a number of sources and so may not accurately reflect the racing configurations used in the cited years.